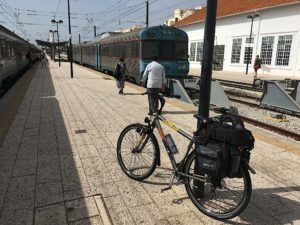 Comboios de Portugal offers a quite frequent train service across the Algarve line: Lagos-Faro-Vila Real de Santo Antonio. This can be profitably used as a backup/support mean of transport for the Ecovia. Bikes are carried for free under some conditions. Inter-urban bus transport in Algarve is operated by two companies: EVA and Frota Azul. Bikes are carried only if stored in bags or boxes.